Investors should understand what is at stake in the territory of Hong Kong. Beyond that, should come the realization that the protests there, and the response of the local government indicates that there will be no real democracy in the former British colony. Neither will there be unfettered capitalism over the long term. Mainland China will continue to tighten its grip over the institutions of the city state. The repercussions of what is happening there will be felt in Macao, Taiwan and throughout China. It brings to a close an era, where one could pretend that the Chinese government was on the path to a broader participation of the citizenry in politics. 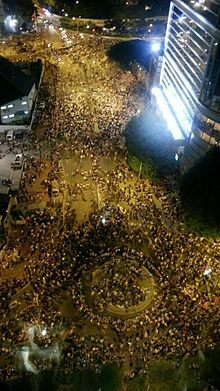 The tens of thousands of protesters run the risk of initiating an invasion of the state by Chinese troops if local police are unable to contain the situation. Already the injuries and arrests are mounting as the government of the territory attempts to restore order on the streets. Force is being applied for now with tear gas and pepper spray, but is sure to escalate if the crowds do not disperse. The demonstrations in Hong Kong began as a result of the decision by Chinese authorities that only Beijing approved candidates, could run for office in the city’s 2017 election for the chief executive of the territory. The claim of the protesters is that the universal suffrage that was promised will become meaningless, if China controls who is eligible to participate in the government of Hong Kong. They further claim, that the Chinese government is violating the agreement reached with the United Kingdom over the status of the former crown colony after the handover in 1997. The understanding included the promise by China that after the handover, the territory would be permitted a high degree of autonomy. The present chief executive of Hong Kong C.Y. Leung stated today, that China will not back down from the current position on Hong Kong. He is absolutely correct in that assertion. Where in the past China might of hesitated before taking action in Hong Kong and Macao because of international repercussions, that is far less likely today. China is beginning to flex it’s power in East Asia much more aggressively and will not be deterred by student led protesters in Hong Kong. On the other hand, the protesters understand the growing presence of Chinese authority in Hong Kong and are fully cognitive in what that will bring. 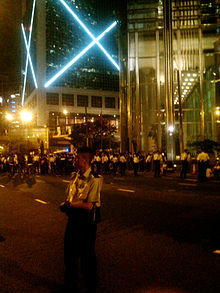 The demonstrators and the government authorities in Hong Kong are at an impasse. There really is very little room for negotiation, given the pressure Communist authorities in China will put on the government in Hong Kong. The officials in Hong Kong and in China are speaking with one voice when they state openly that the protests are illegal. There now has been a widespread disruption, to the heart of one of Asia’s biggest financial centers. This will have an impact on the economy of Hong Kong and that of its neighbors. The reports and visual images of the harsh response of local police against the student demonstrators, was shocking to the city and to the world. It is a big shock for a city that has gained fame for law and order as well as civility. 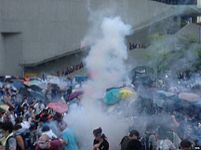 The growing support of the movement known as the umbrella revolution because of the large number of protesters using such devices as a shield against the sun and tear gas, is running against reality. One only needs to point to what occurred at Tiananmen Square in 1989 to understand what will happen in Hong Kong. Where Deng Xiaoping hesitated at first, weighing the pros and cons of a government and military crackdown at the time, the present leadership under Xi Jinping has no such illusions. Stability means survivability of the Communist Party in China. There is no way China will tolerate what is going on in Hong Kong if the protest continues to spread. China has some troops already stationed in the territory but would probably need further reinforcement from the mainland if the movement grows larger. What China will most likely engage in is a bit of subterfuge. They will employ some of the same tactics that Russia employed in Crimea and eastern Ukraine. There the Russian military imported little green men, that is military personnel that did not carry any insignia which would designate where they where from. In Hong Kong that will mean sending out armed thugs that will infiltrate among the demonstrators. They will turn the mostly peaceful demonstrations violent. There will subsequently be a destruction of property and people will be killed. This will justify a Chinese military response and if need be, an invasion of Hong Kong. The Chinese troops will be there to restore law and order Chinese style. Chinese authorities from the mainland are already managing the situation. They are restricting the flow of information that is coming from Hong Kong to other areas of China. State media is giving very little coverage and even instagram is being blocked by authorities throughout China. Social media is coming up against a strong firewall, previously set up by Chinese authorities for just such emergencies. For now, the regime in China is content to let officials in Hong Kong handle the situation. However make no mistake, if things get out of hand, there will be a military response from China. If the demonstrations were to spread from Hong Kong to elsewhere in China, expect a military crackdown even sooner. The Chinese government will consider such activity like a contagion. Hong Kong will be at first isolated and then dealt with in an efficient and roughshod fashion. The present government of China rightly fears discussion of political rights as well as dissent and civil disobedience. It is an anathema to the Communist authorities in general. What will this mean to the world of investment? Stock markets around the world took somewhat of a hit yesterday. If events continue to spiral out of control in Hong Kong, one can only assume that this will continue. The number of travelers to Hong Kong and China will decline. The tourist industry as a whole will be effected in the region. There will soon be a drop off in new investment in Hong Kong and if China proper gets involved, there as well. It will not help the Chinese economy, that is already slowing down faster than the government authorities would like. This will have in turn, have an affect on the global economy. Taiwan will once again observe what a closer relationship to the mainland will bring. Expect the independence movement there to gain steam. China’s neighbors will have to deal with new anxiety of what a militarily stronger China will mean in the future. Expect Japan and South Korea as well as the Philippines and Vietnam to continue to beef up their defensive capabilities. The Hong Kong dollar will decline in value and the China’s currency the yuan, will also take a hit. Further abroad, turmoil in China will strengthen the United States dollar. It will be once again, seen as one of the last bastions of security. Investors in currencies will move more of their portfolios to dollars. As the American dollar appreciates in value it will make exports from the United States more expensive. This will of course have a definite impact on the struggling American economy. A rising dollar will have a dampening effect on world commodity prices, including gold and silver. A number of commodities were already declining in price as a result of the economic slowdown in China and East Asia overall. This will have a huge impact in nations that export commodities in the region like Australia and New Zealand. A diminution of commodity prices will eventually impact all those nations that are overly dependent on the export of natural resources including countries like Chile, Peru, Mongolia, and so on. It will have investors reconsidering further investments in mining and energy, in nations as widespread as the United States, Canada, Norway and elsewhere. Since the instability component is already factored into world energy costs, expect even further declines in the short term for oil prices. Uncertainty is never good for business and investment. It is the one element that entrepreneurs and investors abhor alike. The involvement of China in any world event, is bound to impact the world economy. That is why one can expect that Chinese authorities will want to resolve the situation in Hong Kong as quickly as possible, with a minimum of involvement. However, let there be no misunderstanding. China will not permit Hong Kong to chart a new course, that does not meet the goals of authorities in Beijing. One can expect some denunciations and expressions of concern from the West. This is most likely to come from the United Kingdom and the United States. It will not matter. The Chinese are certainly aware that recent events make any serious action by the Western powers highly unlikely. Besides, despite its unique status, the situation in Hong Kong is really an internal matter. The President of China has had time to size up, the present American administration. There is a full realization that although there might be some public condemnation if violence and military action is employed in Hong Kong, it will not amount to much.